We believe in making the most of our real estate ... so adding toys to the walls is a bonus for us! This is a nice, soft piece of chewy pine that has multiple colorful corks drilled into the wood. What fun!! It comes with a big washer and wing nut for easy attaching to your cage. 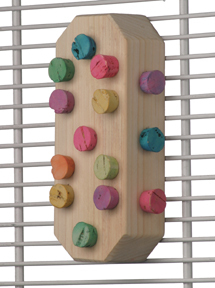 Use your imagination with placement ... it CAN be hung from the top of your cage as well as conventionally hanging inside or outside of the cage for added challenges and beak pleasing fun!